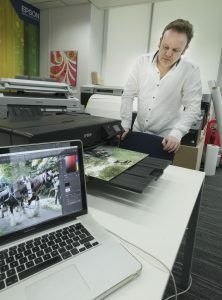 Huge thanks to the team at Epson UK in Hemel Hempstead especially their printer guru Paul Restarick. Viv and I went up to the company HQ on Friday and checked out various media to print on, printers and printer settings. Firstly someone told me recently that some photographers are snobs about Epson papers, which I have always found strange. I have been using Epson printers and media for exhibitions for years, in fact my they sponsored my first retrospective, 30 not out, at the Jersey International Art Festival 14 years ago. This was my first show to be produced digitally and not by traditional photographic printing, though it had a mix of scanned and digital images and the archival properties of Epson’s pigment inks are being born out by the fact that images from that show are still on the walls and unfaded. With “The Last Herd” the exhibition will be used to help launch the book and strictly limited edition prints will be sold like the book, to help raise money for Operation Centaur, the charity that is responsible for the Royal Parks Shires. Each of the images in the show will be available through the online gallery Photography into ART. With fine art limited editions, consistency is all important and this is were quality, well set up printers are all important. The latest Epson UltraChrome HD printers, such as the P800 we used for this print run are always spot on. 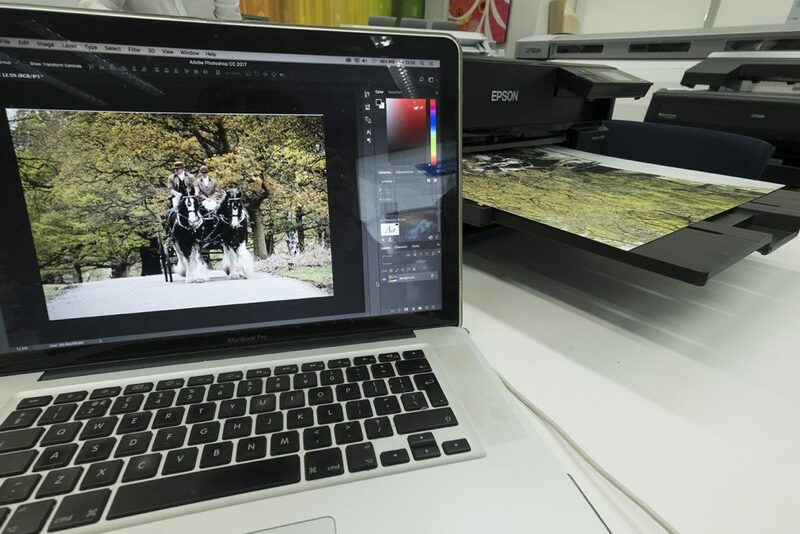 For these images we printed from Adobe PhotoShop onto Epson’s Cold Pressed Natural, A2 size paper, for the technical, the colour output was set to perceptual and the printer profile was the “out of the box” one within the P800 driver. The print quality is exceptional, almost all the images come from the Fujifilm X-Pro2 cameras, which have great depth of colour and natural tones. This is very evident in the prints, many looking almost holographic in their detail. As a check I printed images and then saved the files on the P800 at Epson, then printed them on the same media on a different P800 at home and they are identical, so the quality of the edition prints is guaranteed. The exhibition is sponsored by Epson for the printing and by Seawhite of Brighton for the framing so again a great thanks to both of those companies for their help in realising this project.